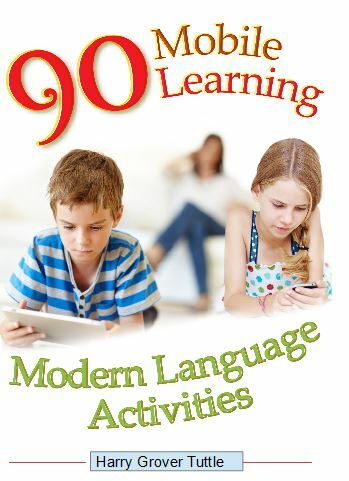 ** 90 Mobile Learning Modern Language Activities ebook http://bit.ly/90mlact Instantly use these communication and cultural activities even if half the class has mobile device. Also, available as a pdf. – Grammar speaking games (pairs or small group). Improve your students’ modern language communication and culture awareness through mobile learning tools and apps. Engage your students in these easy to integrate in-class and out-of-class learning in fourteen different mobile categories. Have them participate in authentic culture. My structured Spanish spontaneous speaking activities (24+) includes Structured Speaking (Students substitute in or select words to communicate in pairs), Speaking Mats ( Student can talk using a wide variety of nouns, verbs and adjectives to express their ideas in pairs or small group), Modified Speed Dating (Students ask their partners one question from a card-whole class), Role Playing (Students talk as people in pictures or drawings from 2-4 people), Spontaneous Speaking (based on visuals or topics in pairs), and Grammar speaking games (pairs or small group). Available for a nominal fee at Teacherspayteachers: http://bit.ly/tpthtuttle. At the same site, I have a series of activities for any modern language such as visual stories with no words (the beach, the city, school, etc.) for two students to role play; the restaurant role play involves four students. Do We Teach Modern Language Survival Skills? A follow up question is “How well do we prepare our students to communicate in the target language?” Do we truly teach them survival skills? An exchange student emailed his mother that he had not learned how to say “Where is the bathroom?” so that was the first thing he looked up on his computer when he got to the target language country. Another student commented that she wished her teacher had spent more than two minutes on “turn right.. turn left..go straight..two blocks” so that she could follow map directions. How well can your students communicate their basic survival needs? 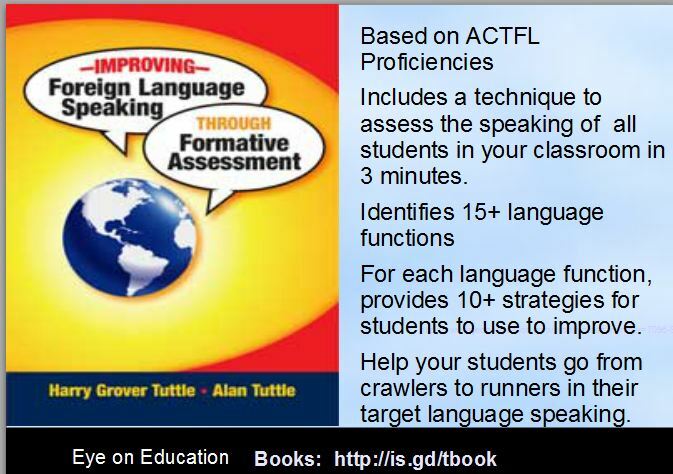 My e-book, 90 Mobile Learning Mobile Learning Activities, promotes language communication through fourteen different categories of easy-to-implement mobile activities.